Goats are ruminants, meaning they have 4 stomachs. A goat's rumination method of processing food requires plenty of roughage and fiber to work properly. Unlike other domestic ruminants like sheep and cattle, goats are not considered "grazers". They are more like deer and are "browsers" eating from high to low, preferring trees and shrubs to grass. They are notorious for wasting hay as they will pick out the best parts first, but it is perfectly natural for them to nibble here and there. If you are considering getting a goat as a "lawnmower", just know they will eat your trees, rose bushes and raspberries long before they even touch any grass. We feed about 8-9 ton of hay per year. Depending on the season and weather conditions the amount and type will vary. 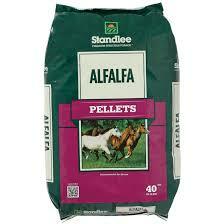 Milking does will have about 2# per goat of 90% or higher alfalfa fed 2X a day. Everyone has free choice grass hay that is usually a 70-30% timothy, orchard and alfalfa mix. Our pastures have a variety of grass an forage for fresh grazing variety. We feed mostly what is available and convenient at a reasonable price. Some of the specific feeds we use on a regular basis are pictured to the right. What each goat gets as far as grain depends highly on age and stage of lactation or development. Pregnant and lactating does will generally receive higher quantities of the heavier protein and fiber. Kids will get more fat in their diet, and bucks need very little extra feed supplements except for during breeding season. We do not recommend giving grain to wethers (neutered males) unless we are trying to "finish" them before butchering. Even then, the muscling from a good quality alfalfa hay and forage is, in our opinion, better than grain finish. The biggest thing that can affect the health and productivity of a herd is proper minerals. We feed a loose mineral that is formulated for the Northern Rockies being higher in selenium and also balanced well for goats in copper, phosphorus, magnesium, zinc and cobalt. In addition to the loose mineral, we have a variety of salt licks available and Vitalix protein and vitamin tubs. Before and after kidding, we give a selenium and vitamin E paste to the does. This helps replenish and maintain energy during a stressful process. We also keep powdered and paste electrolytes on hand for a plethora of scenarios. Electrolytes are important when the weather gets outrageously hot as well as general traveling, shows, moving pens and any time an animal is off feed or under the weather. We cover our bases by administering plenty of electrolytes! Please Do Not Kill Your Goats With Kindness!!! It is and easy thing for people to love to spoil their goats, and why wouldn't you? They are perfect and adorable trouble makers. BUT goats have a more delicate digestive system than most realize, particularly when it comes to fat. Goats layer fat on their internal organs (heart, lungs, liver etc..) before they will get outwardly fat. Dairy goats especially will never and should never be plump, they are designed to be very lean athletic animals. The health problems on severely overweight goats can quickly spiral out of control and can end with a very sad and painful good bye to the pets you loved so much! Treats are a great way to train goats to new pastures, new gates and in general showing and handling. Our goats are particularly fond of peanuts. Whole in shell, no salt, roasted or raw no mater, they love them! We also like banana chips, they are cheap to make ourselves (no sugar added) and the people can enjoy those treats too! For the most part the milking does are picky and we don't want their milk to taste like last weeks leftovers. For bucks and dry stock, we will give fresh corn husks, garden vegetables, pumpkin and other things that come from our garden. In the end the only ones that really like compost are the chickens. Bio-security is very important to us as well as maintaining a healthy herd. We like to use natural methods when we can, but some situations require more conventional methods of treatment. All new animals are inspected and quarantined for a time period before being introduced to the rest of the herd. While we do offer outside breeding to our bucks, we expect the same kind of disease prevention and awareness and require a health check before any goat is exposed to our herd. We use herbal worming methods as preventative but use conventional wormers (SafeGuard and Ivormec) as needed. Kids are treated with herbal preventatives for Coccidiosis but again we will also use Dimethox or Corid if necessary as treatment. Since veterinarians that know goats are hard to come by or are often unavailable, we keep a fully stocked medicine cabinet for just about every medical emergency no matter how big or small! We don't pretend to know everything and raising animals is always a learning and growing process. Fortunately there are some great minds with years of experience that have published lots of information for the public on other internet sites. There are many methods to raising goats and ultimately you have to decide what works for you. The biggest thing to keep in mind is the more you read you will find yourself in fewer emergency and dire situations. Preparation is key! Here are some of the sites and resources we have found extremely helpful for general knowledge as well as last minute planing and emergencies. ADGA offers a variety of learning materials for herd management and performance programs! There is so much to learn from the professionals! My hometown goating group! They host shows, LA events and offer links to other breeders around the state. Based in Great Falls this group also hosts great shows and events.